On foot of the previous post, a reader asked me for some analysis of comparatives between Bitcoin volatility and Gold price volatility. It took some time to get to the answer. One of the reasons is that Bitcoin is traded continuously, while gold prices are listed for specific markets trading dates. So it takes some time to reconcile two data sets. Overall Bitcoin price volatility is magnitudes greater than volatility of gold prices almost always. 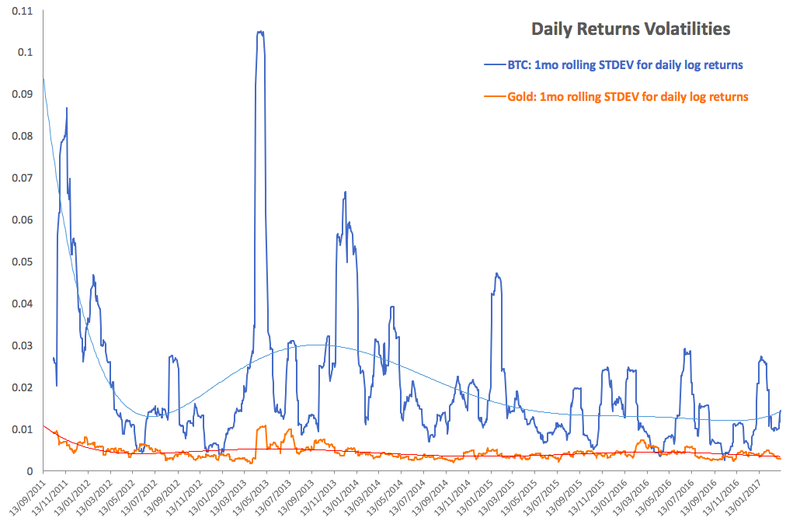 Historical standard deviation in daily returns is 2.663% and Gold price (log daily returns) volatility is 0.466%, which means that historically, gold daily returns are less volatile than Bitcoin daily returns by a more than a factor of 5. There are, broadly speaking three key periods of Bitcoin volatility: the period from September 2011 through December 2012, when volatility was extreme and declining, the period from January 2013 through February 2015, when volatility in Bitcoin was characterised by severe spikes and elevated base, and the period from March 2015 on, when both the spikes in volatility and the base of volatility abated. 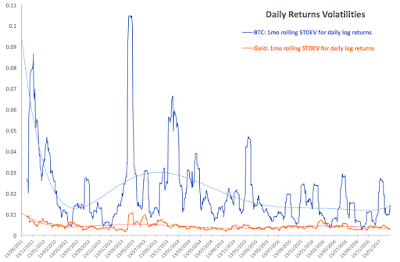 These three periods are associated with the following comparatives between gold volatility and Bitcoin volatility: period through December 2012: gold daily returns volatility 0.520% against Bitcoin daily returns volatility of almost 6 times that at 3.00%; period from January 2013 through February 2015, when Bitcoin returns volatility (3.27%) was almost 7.5 times gold returns volatility (0.479%), and the current period from March 2015, where Bitcoin daily returns volatility (1.421%) was over 3 times daily returns volatility for gold (0.412%). Note: these are log-log returns, so much of extreme volatility is smoothed out and this benefits the Bitcoin. There is a long-term trend difference between gold returns volatility and Bitcoin returns volatility, as shown by polynomial (power 6) trend lines for both. In fact, even in terms of trend, Bitcoin is much more volatile than gold and Bitcoin's volatility is less stable than volatility of gold. In very simple terms, Bitcoin volatility is vastly in excess of Gold's volatility, albeit the former is starting to moderate in more recent years. 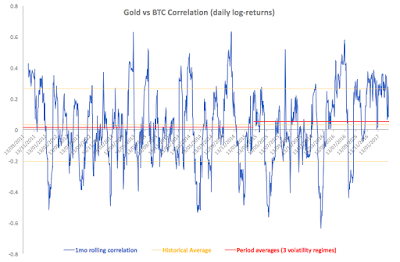 Average 30-days running correlation for Bitcoin and gold in terms of daily log-log returns is 0.03025 historically, which is statistically indifferent from zero. 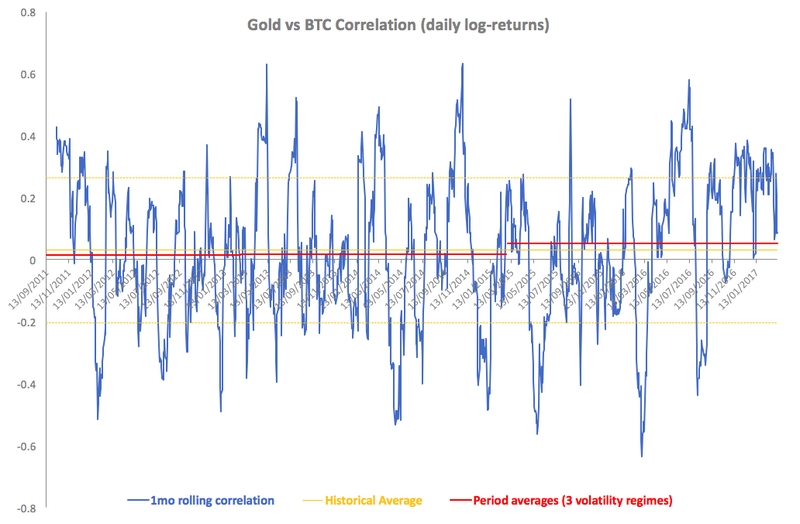 Across the three periods of Bitcoin volatility structure (defined above), average correlation between Bitcoin and gold log-log returns was 0.0147, 0.0182 and 0.0529 respectively. All of these are statistically indifferent from zero. In history of the Bitcoin, there were only 7 occasions on which daily returns were correlated positively with gold price with correlation in excess of 0.5. and 5 with negative correlation in excess of -0.5 in absolute value None with correlation in excess of 0.65 in absolute value for either positive or negative correlations. Bitcoin comparatives to gold hold about as much water as a colander hit by a shrapnel shot.